Rigid strapping tape. This is also known as athletic tape or sports tape. This is used to reduce your range of movement, support injured joints, or align joints or structures. Elastic strapping tape. This is often used to rehabilitate, align, reduce range of movement, relieve pain, or support injured structures in cases that require less rigidity. Kinesiology tape. This tape is almost similar to elastic sports tape with its function solely focused on assisting muscle function. Depending on what injury you have sustained, your physiotherapist will determine what type of tape will be used and where it will be used. Some common examples of taping would be the use of rigid tape for ankle strapping to limit its range of movement after an injury or the combination of elastic and rigid tape for shoulder taping. Kinesio taping, for instance, can be used for calf taping to remove more weight from an injured structure. Aside from the shoulders and ankles, strapping tapes are used on the knees, back, hand, and wrist. Some are also used on fingers and elbows. Before applying the tape, the skin in the area to be taped has to be prepared. It should be shaved, at least 12 hours before the taping starts. The said area should be cleaned using a tape remover or body oil. Broken skin or rashes must be covered with a non-stick wound pad before putting on the tape. For tape-sensitive skin, an underwrap is best applied to the area to be taped. Make sure to follow manufacturer’s instructions in using the tape. During the taping process, the tape should be tight enough for it to work as it was designed to work. Flex your muscles to get the proper muscle tension when you’re about to apply the tape. But don’t make it too tight that it would cut off blood supply, to the extent that the skin color in the area won’t return to normal after releasing it. Make sure it’s not too loose either or all your taping effort will go to waste as it won’t provide proper joint support. If you feel tingles or numbness in the taped area, remove it and readjust its tightness. While the process might seem simple, the taping is best done by a physiotherapist. 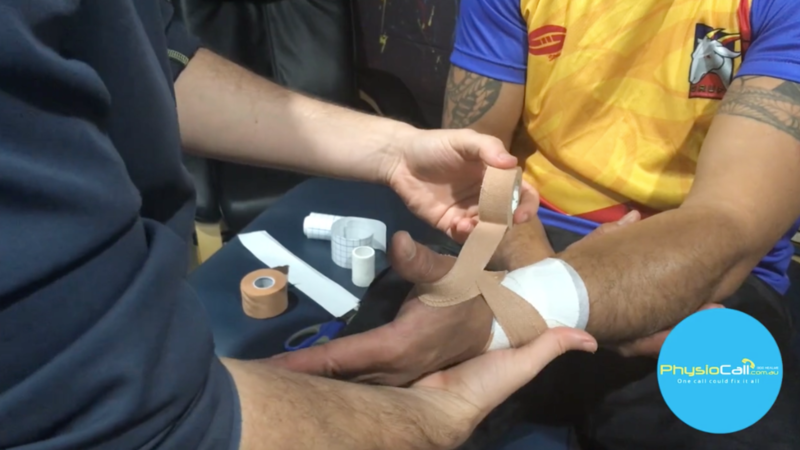 If you’ve gone to one to have your injury treated, make sure to observe their proper taping technique. If you or a loved one needs to apply a strapping tape to an injury, book with PhysioCall Gladstone today!